I learned how to make many easy Mexican food recipes which can be put together very quickly using already prepared ingredients. These foods can be canned, dried or frozen; all partly prepared for you to quickly use. Many products which people made years ago like butter and cheese are also considered convenient foods; cheese is a necessity when cooking Mexican foods. There are a wide range of products coming from names like Old El Paso, Pace, Campbell’s Soups and many others which help in the cooking of easy Mexican foods. Sauces and soups from these companies help to make these recipes quick and easy. Where would we be without already prepared corn and flour tortillas? Or taco shells? Think of the time it would take us to make our own. You may not consider dried spices as convenient foods but they are. They are so easy to purchase in the grocery store. I quickly learned that none of the easy Mexican food recipes are the same without spices; these make the recipes. Although I prefer fresh cilantro, hot peppers, garlic, basil, oregano and parsley, when I am in a hurry it is much faster to grab the dried herbs and spices. This is why I always keep the dried ones in my kitchen. Cook the beef in a skillet until browned; Drain off any fat. Add the soup, salsa, water, tortillas and half of the cheese. Heat to a boil; cover and cook over low heat 5 minutes or until hot. Spray saucepan with vegetable cooking spray. Add chicken and cook until brown, stirring often. Add the broth, rice and cumin and heat to a boil; cover and cook over low for 20 minutes. Stir in the corn, salsa, cilantro and lime juice; heat thoroughly. NOTE: To make crisp tortilla chips cut 4 corn tortillas into thin strips. place on baking sheet. Spray with vegetable cooking spray. Bake 10 minutes or until light brown. 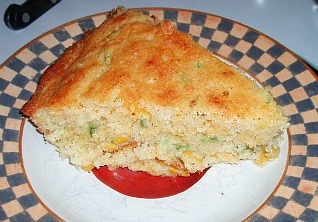 I learned how to make some easy Mexican food recipes like this cornbread which does have some fresh ingredients added like the peppers and onion. I made it this morning and it is so delicious I decided to include it for you to try. 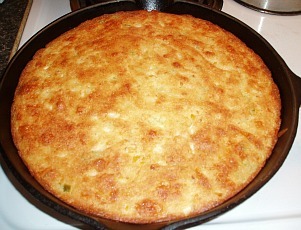 I baked it in my iron skillet which is great for cornbread. If you do not have one, use a 9 X 13 inch greased pan. Grease skillet or pan with solid shortening (I used bacon fat) Combine and mix all ingredients in a large bowl; pour into greased iron skillet. Bake 35 to 40 minutes or until pick comes out clean. Pace Picante sauce helps to make many easy Mexican food recipes. Combine chicken, picante sauce, onion and cumin and mix well. Heat ½ inch oil in heavy skillet to hot but not smoking. Quickly dip tortillas in hot oil about 2 seconds to soften; drain on paper towels. Spoon 1 tablespoon chicken mixture and 1 tablespoon cheese down center of each tortilla. Roll tightly and secure with wooden pick; place seam side down on baking sheet. Bake for 18 to 20 minutes or until crisp; serve warm with easy guacamole recipe.